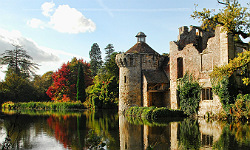 Looking for catering jobs in Kent - Kent is one of London’s surrounding counties. Currently there are two restaurants with Michelin Stars in Kent: The Sportsman in Whitstable and the West House in Biddenden. In addition there are many more gastropubs and restaurants rated in the Michelin Guide. If you're looking to relocate to Kent with your next catering job move, Kent has beautiful beaches, stunning castles and exciting culture.